The words “Northern Minnesota” evoke a range of responses, including wonder, shivers, shrugs, and smiles. But nobody knows Northern Minnesota like those who live and work there; and that’s what gives Kraus-Anderson’s Bemidji office staying power. In April KA’s Bemidji office celebrated its 25th anniversary: a milestone that includes nationally-recognized work, loyal clients and business partners, and a significant record of community service. To commemorate the achievement, here’s a patchwork of perspectives from a cross-section of KA Bemidji employees. Q: For those who’ve never experienced Bemidji, what are they missing? 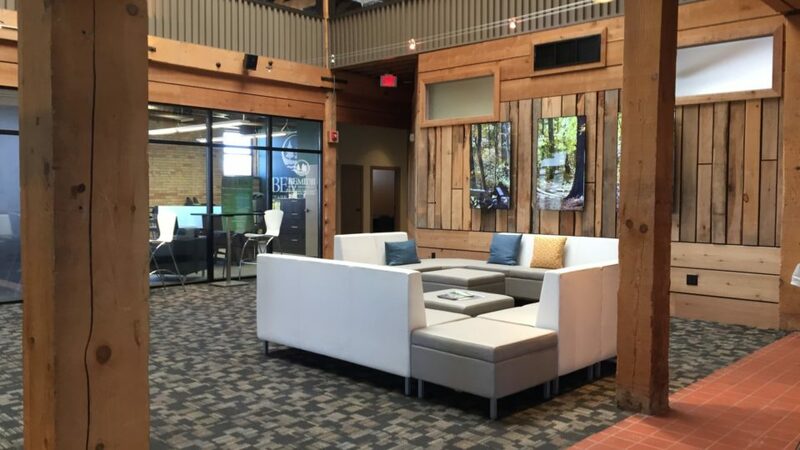 The repurposed Mayflower building is now a launch pad for tech business in Bemidji. TRACY POGUE, DIRECTOR OF BUSINESS DEVELOPMENT: Bemidji is not so much of a secret anymore. We are a very entrepreneurial center that has Bemidji State University and Sanford Health driving our economic engine. We just hosted our first TEDxBemidji event, which was sold out. Our art and culture scene is something that we are very proud of as well. Some used to think of Bemidji as a nice place to come for a weekend. That has changed enormously. Just recently we celebrated a groundbreaking for a new $30 million elementary school and several multi-million dollar projects begin this spring and summer. Bemidji youth sports are a huge economic driver as well, with hockey being the biggest economic impact in our community 12 months of the year. BOB FITZGERALD, DIRECTOR OF OPERATIONS: In Bemidji, you are able to strike the perfect work-life balance. Our community has all the regional center amenities to support your business and workforce, while maintaining the small town beauty and character that makes this place “home.” It is a balance that no other regional center has mastered. Q: What are some of the significant projects and clients from your time at KA? BOB FITZGERALD: The healthcare market has always been a big sector for the Bemidji office. In that sector, the long-term relationship with Sanford Health (previously North Country Health Service); the new hospital in Grand Rapids- Grand Itasca Clinic & Hospital; and albeit a different sector, the largest project ever completed out of the Bemidji office, Sanford Center (aka Bemidji Regional Events Center). There are so many strong relationships that we have developed over the years, it is difficult to name them all, but therein lies the foundation of our success. GARY FRANCISCO, PROJECT SUPERINTENDENT: Hill City Schools, Grand Rapids Library, Cub Foods, Riverside Elementary in Brainerd; Calvary Lutheran Church in Longville. (I was the first one married in the church); Crow Creek Tribal Schools, Stephen, SD, for the Park Service and the BIA. Good Samaritan Nursing Home and Assisted Living in International Falls; Itasca Biological Field Station, U of M; three buildings for Ziegler in Mt. Iron, MN; Glenwood DNR office headquarters. These are a few of many projects I was superintendent on. At this point there are too many to remember. Q: What are the major changes you’ve seen in your time at KA? GARY FRANCISCO: The evolution of technology…there were no computers, iPads or cell phones in the office trailers when I started (in 1992). We had a pager, fax machine and a hard phone line. I’ve seen the company come together as one. I’ve seen the company as a whole grow, with the additions of new offices in Duluth, Wisconsin, North Dakota, Rochester, MN. I am proud to have been a part of the great success KA has had both in Minnesota and the U.S. In recent years I’ve seen a huge positive change in our training and safety efforts. KA has made a conscious effort to keep up with the industry and get its employees the tools they need to succeed. FRED GRAVES, YARD MANAGER: The Power of One. This revolutionized how my small part of KA works. Q: What are the major changes you’ve seen in Bemidji during your time at KA? BOB FITZGERALD: Make no mistake, Bemidji isn’t a sleepy, rural, up north tourist town. The region has one of the state’s fastest-growing and most vibrant economies. So Bemidji’s emergence as a regional center would have to be the major change. TRACY POGUE: The focus of millennials and the entrepreneurship of so many is really a major driver in our community. The “Launch Pad” and Greater Bemidji are not only clients of KA, but we are involved in shaping Bemidji for growth in so many sectors. Q: KA’s community involvement has been a huge part of our story. What are some of those highlights? TRACY POGUE: Top of the list for me was being president of our hockey association. Our team at the time (2010-2013) put Bemidji back on the map as a place for so many communities around the 5-state area, Manitoba and Ontario travel to Bemidji for weekends at a time. The KA Walleye Classic will always be one of my favorite events that I was part of. We helped raise and give back over $600,000 to local charities in our community. A humbling experience. Q: How tied to the “mother ship” is the KA Bemidji team? How do you draw from that central resource? BOB FITZGERALD: While there is some autonomy, we are very closely tied to the KACC headquarters. Open communication and support both ways lends to our ability to access all KA resources across construction as well as our sister companies such as Development, Realty and Insurance. TRACY POGUE: We are an integral part of KA as a whole, KA management realizes that most relationships begin with being intertwined with our community. We are encouraged to do our own thing within the framework of KA’s core values. Many times a week I find myself looking for someone who might know this person or a specific company. The wealth of experience in the metro is truly a great resource to me. Q: How do you assert your independence? BOB FITZGERALD: We assert independence by staying true to our office culture and the communities we work and live in. TRACY POGUE: We show our independence every day by letting folks know we live here, go to church and sporting events here, support the causes that are near and dear to our community. Q: In your view, what are the Bemidji community’s greatest challenges today? BOB FITZGERALD: People recognizing Bemidji as a viable option to locate their family and/or business; labor to address the growth in the region and along with that, housing to support the growth. TRACY POGUE: What I call the “trailing spouse,” when someone is recruited for one of the over 1,000 open jobs right now in Bemidji, typically the spouse will need to find work as well. Matching both up to something that is rewarding both financially and personally can sometimes prove to be a challenge. To that end, we are working as a community to talk to each other when hiring to make sure we can place spouses in a warm environment and make sure they integrate to our community well. Opportunities: We have so much going on in this community is truly a blessing. Sanford Health is growing at an unbelievable pace. With that growth comes all sorts of opportunities for our community. Bemidji State University and its iconic location on Lake Bemidji continues to produce graduates in many degrees. A community goal is to keep those graduates here in our workforce after graduation. Q: What are KA Bemidji’s greatest challenges, and opportunities, today? BOB FITZGERALD: Challenges: Maintaining growth; labor and pressure from increased competition in the marketplace. Opportunities: The growth of the entrepreneur community is lending itself to demands on their facility needs, and capitalizing on our position as the leader in the market. FRED GRAVES: Typical challenges are communication based. There are no challenges, just opportunities. Q: What’s the atmosphere like in the office? How would you describe your work environment? SUSIE ERICKSON, PROJECT ASSISTANT: Laid back and family-oriented. We all care about those we work with and enjoy socializing with each other. It is not just a place we spend 8 hours (sometimes more) of our day; most of us know each others’ likes and dislikes and are comfortable joking around. Even though we joke around a lot, we really do know how to get things done and continue to make our office a valuable part of the KA company. CHELSEA OLDHAM: We can be intense and hyper-focused when called for. People step up to get stuff finished. On the other hand, I have been involved in light saber duels, gotten shot by nerf darts, learned all about Finnish Ninjas (Finnjas, for short). We know how to be ridiculous…in some ways, I think we are over-qualified. Q: What inspires you about working at KA? DAN WAVRIN, PROJECT SUPERINTENDENT: You can always expect professional people, both subcontractors and our own people, on any given job. FRED GRAVES: What inspires me at KA is the phrase, “I built that.” I have not built anything myself, but I can drive around the state and point out things that KA has completed to my wife and kids. SUSIE ERICKSON: I really enjoy the company of my co-workers. I like the way everyone works together to get our jobs completed and how we are proud of the quality and accomplishments we have made. BOB FITZGERALD: I am proud of what we do, who we work for, and who we work with, (internally and externally). GARY FRANCISCO: Being involved with growth and decision making. Every new job I start is another chance to meet new people whether it be owners, subcontractors, end users or a different project team. It’s all about the people and another opportunity to learn and be successful. CHELSEA OLDHAM: Solving problems with elegant solutions. Q: What’s a general piece of wisdom you’ve gained over your career in the field and working with project teams? GARY FRANCISCO: Make sure you always do the right thing and value people. Every team and individual in it has their own set of strengths and weaknesses. Learn what they are and help each other out. TRACY POGUE: I would like to thank all of those who came before me in my role at KA and left so many relationships for me to step into. So many people have made it that much more enjoyable for me. We truly have a wonderful community here in Bemidji and Kraus-Anderson is a big part of it.